I've known about Dir En Grey since my sophmore year in high school. I was really introduced by a couple of my friends, how ever at the time I wasn't so much into hard metal music or screaming. At that time they were also beginning to transition out of their Visual Kei genre to a more metal/hard rock genre. My friends had told me that there were also some slower songs and that maybe I should work myself up. So I began listening to some of Dir En Grey's music and came across one song that just seem to tie itself. Mushi. This song's lyrics had me bawling my eyes out so much that they were dry for about a week. Okay, so I exaggerated a bit but the song did have me on an emotional roller coaster which is why I think I really got into this band. 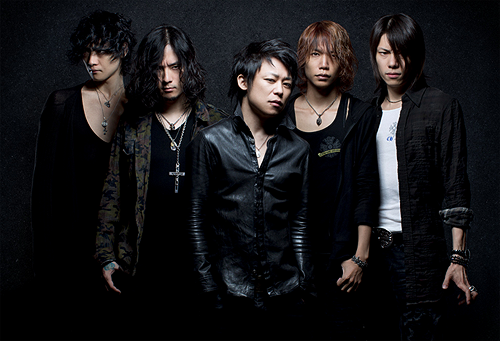 The vocalist is Kyo and he also writes the lyrics to the song. The leader of the band is Kaoru who is also one of the guitarist. Die is the other amazing guitarist. Toshiya is the bassist and last but never least Shinya is the drummer. Shinya also does percussion while everyone contributes to back vocals for Kyo. If you like bands that love to expose the truth about governments and expose the ugly truth about the human race then check out this band. Kyo's lyrics are so well said that even in Japanese I can fully understand the message. I do love some of the symbolism used in their videos as well as some of the metaphors. The band also very close to the epicenter of the 2011 earthquake was furious when the Japanese government had lied to their people and the world about the radiation levels. The band then launched a website to help raise awareness about the lies spread and to help stop them. The campaign is called Scream for the truth. A link to the website will be posted down at the bottom. The band is amazing. Kyo packs very powerful vocals along with his blood curdling screams that reflect the true emotions of the song. The band plays their insturments with such grace and dedication that I'm kind of envious. Dir En Grey was actually produced by Yoshiki and so far has been one of the only bands in the Japanese music industry to keep all the original artist. My question is how do they do it? My favorite albums of the band have to be Kisou, Macabre, Withering To Death and Marrow of a Bone. These albums I have to say are in my top catergories but over all I love the band and all their music but does Dir En Grey still have a stronger fan base than they did when they first began. My personal opinion is yes. Dir En Grey may not be Visual kei anymore and Kyo may have deemed it necessary that those who only continue to see them live because of their "visual aesthetics" are better of just staying home a lot of fans who are not an avid Japanese rock listener as I am still flock to see the shows. I remember seeing them live in Chicago and I believe after the concert I developed a high case of claustrophobia. I give this band a 10/10. The lyrics and story lines are just horrifically amazing and sometimes even tear jerking so if you're crying to some songs of Dir En Grey, it's ok I have too. The band is stable and well rounded also which is a plus and they know what they expect out of their fan base. I think anyone who is a fan of Dir En Grey would completely understand where I am coming from when I said this is a no non-sense, eye opening the government should be exposed type band especially after there was a chance that Kyo may have never been able to sing again but the band is still continuing strong. Guys Keep rocking and I'm waiting for your next album!